Blockchain – its essence and its technology- affects domain names and their values, and vice versa. See and understand the bigger picture. All investors and entrepreneurs who are looking to understand the intersection of domain name and blockchain should watch this show. Chad describes himself as a Digital Architect helping build world-leading Autonomous Entities. 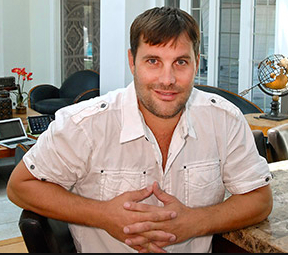 He is one of the original full-time domain investors in the industry: co-founder of Domain Holdings Group, founder of eCorp.com and Global Ventures, LLC (a technology-based venture development, advisory and investment group established in 1996), and founder of VNOC.com and Contrib.com. Chad has also been particularly active in connecting with legislators as laws are build around domain names. With the unique perspective of a life-long entrepreneur, Chad consults entrepreneurs and professionals on how to increase asset value quickly by leveraging time compression tools and network effects to create valuable and distributed digital ventures in a stakeholder model. Very hard to follow! What was this episode about? Great interview and assumed that LinkedIn would have owned Linked.com. Maybe it’s my small mind but does having foul breath add to the integrity of the conversation? WoW… you got any sense out of this. you are way ahead of me. He starts in the first few minutes letting us know how he’d register TMs of big brands that launched products before they secured the url…. The rest was cringeworthy the entire time. Cudos to Tess and Andrew for trying to pull it back in. Andrews great analogy on a commercial property was completely lost on Chad. Chad and Rob Monster in a 1 on 1 interview trying to explain their business model in under 6000 buzzwords.